be it Solar, Wind or Hydro as well as generator based systems. remote monitoring systems can also benefit from battery condition monitoring. The TriMetric 2030RV is an updated version of the 2025 RV. quickly and easily check the state of charge of your battery bank at a glance. accurate method of determining the state of charge. 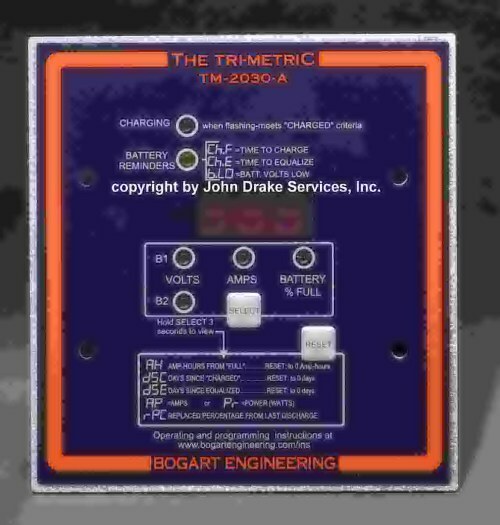 Trimetric 2030 is not affected by recent charging or discharging of the batteries. into or out of your batteries. They are simple to install and easy to use. inconvenience of a damaged battery bank and a sore back. Everything priced on this page is in stock. Bogart Engineering products are made in the U.S.A.
and have a Three Year factory warranty. Meters are Manufactured by Bogart Engineering. These amp/watt-hour meters are for 12, 24 or 48 volt battery systems. It reads volts, amps and amp-hours on an LED display. These can also display voltage from a secondary battery bank. from the batteries for ease of use. Using 22 ga. wire the maximum distance is 55 feet. Using 18 ga. wire the maximum distance is 150 feet. It can be placed farther away if heavier wire is used. The display shows system voltage down to 1/10 of a volt. A shunt is required for operation. inverter and loads you are using. As a rule, you can pull more amps out of a battery at a time than you can put in. For a 12 volt system with a 600 watt inverter the 100 amp shunt should be fine. 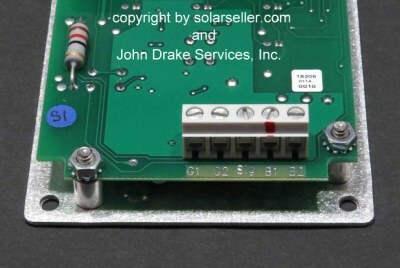 Using a 12 volt inverter over 600 watts you would need the 500 amp shunt. For a 24 volt sytem these hold true - you just double the inverter size. This allows amp readings as low as 0.10 amps. 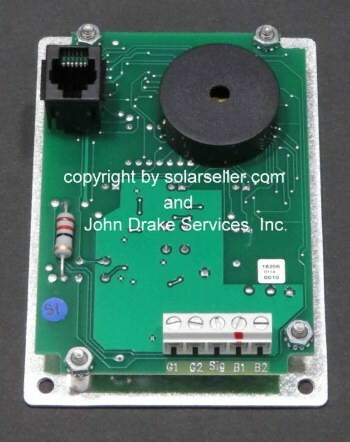 These are suitable for virtually all systems with moderate or large size inverters. to measure only alternative energy input and load output current. 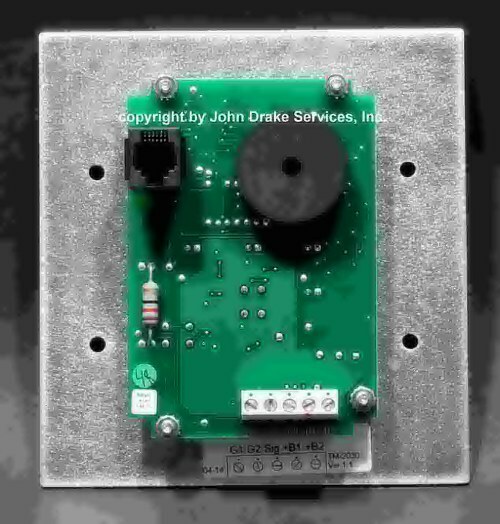 This allows amp readings as low as 0.01 amps. to the earlier Tri-Metric 2020's with a few notable exceptions. They can compute and display either Amps or Watts. They also have built-in lightning protection. addition it will allow you to monitor the voltage of an auxillary battery bank. state of charge than the controller can obtain when used independently. They are designed to be easier to operate than the earlier Tri-Metric 2020 and 2025 models. The TriMetric handles a battery bank of up to 2500 amp hours. Made in the USA by Bogart Engineering. How to dertermine the shunt size you need. You can also purchase this as a package, the Trimetric and shunt. cable connection between the Trimetric and the SC-2030 charge controller (not included). connection to power up the Trimetric. The 2030RV has its own mounting box. 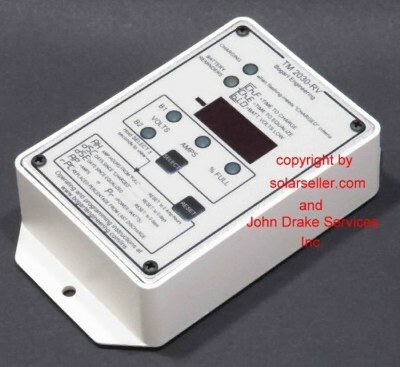 The meter can be removed from its box and flush mounted if needed. Bogart SC-2030 charge controllers in parallel. Most Trace type Power Centers are set up to accept a TriMetric 2030A monitor. app. 3-7/8" tall and 2-5/8" wide. The meter extends approximately 1-1/8" from the back of the face plate. These also fit in a double gang box. show our daily inventory of the 2030A model. not need this as they come with a fuse and holder. top of each block and a #8-32 sense screw on the side of each block. Bogart uses either ATC fuses, as shown, or glass fuses - depending on availability. 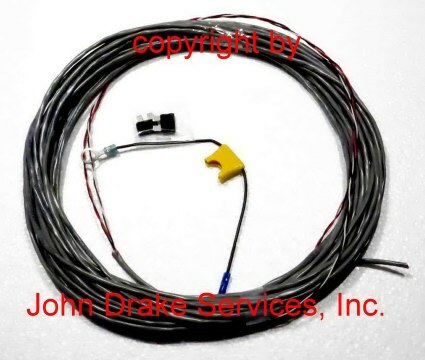 Wiring harness for TriMetric battery system monitors. lengths, 35 and 50 foot. captive lugs on the TriMetric. one spare, and a ring terminal with a 3/8" hole for connecting to the positive terminal of your battery bank. 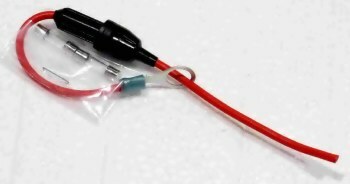 This harness connects your TriMetric to the main or house battery(s) system. your own wire for that connection. an amp hour meter loses its accuracy. gradually and permantly lose storage capacity. 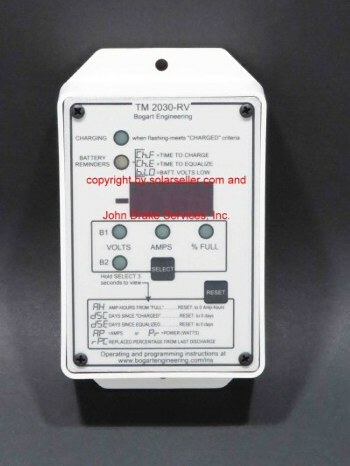 Trimetric 2030RV with 500 amp shunt. Trimetric 2030RV with 100 amp shunt and 35 foot wiring harness. Trimetric 2030RV with 500 amp shunt and 35 foot wiring harness.